The Monthly Jewelry Giveaway for June and July at Denise Ward Designs celebrates Summer days with these breezy, fun earrings. Dressed up or down, compliments will abound! Remember, if you have already registered for a past Giveaway and haven’t won, you are already in the running to win! 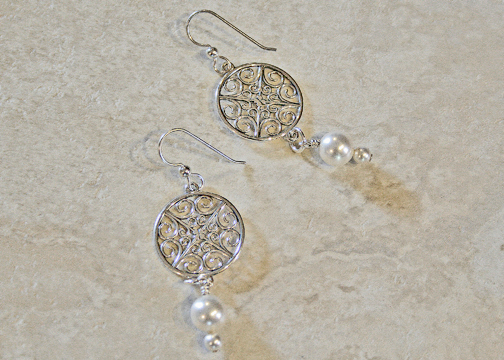 Handmade Scrollwork Pearl Earrings – made with Swarovski ivory pearls attached to delicately detailed scrollwork sterling silver rounds. Earring length is approximately 2″. This entry was posted in Giveaway and tagged contest, free jewelry, giveaway by Denise Ward. Bookmark the permalink. These earrings is amazing. Anyone wears them would be lucky. I love them.